Edinburg Girl Scouts prepare to walk to the Edinburg Fire Department from Edinburg City Hall to take part in a Patriot Day Tribute to first responders Saturday, Sept. 8, 2018, in Edinburg. EDINBURG — Following the beat of a snare drum and a bagpipe player, over 100 Edinburg Girl Scouts marched from City Hall to the Edinburg Volunteer Fire Department on Saturday morning to pay tribute to first responders. 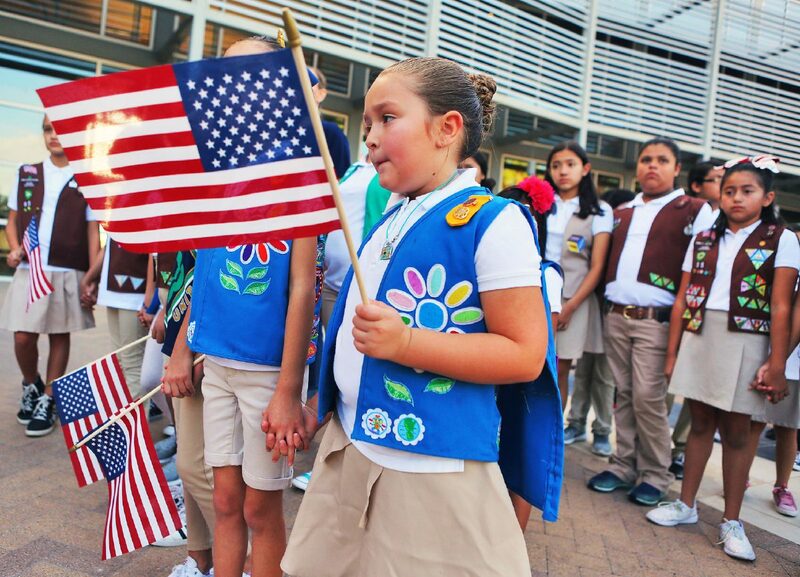 At the end of their march, the young girls were met with rows of parents and first responders ready for the 4th annual Edinburg Girl Scouts Patriot Day Tribute. Lennon Lee Moats,10, ceremony leader and member of Troop No. 407, lead the crowd in the pledge of allegiance and gave opening statements on behalf of the Edinburg Girl Scouts. She and other girl scouts visited New York City this summer where they saw the 9/11 memorial. The massive cenotaph has two large square pools that represent the two towers and the names of all 2,996 people who were killed in the attack. That experience helped them gain a new appreciation for service members. Edinburg Fire Chief Shawn Snider said he appreciates the gesture from the Girl Scouts, adding that 9/11 was a turning point for patriotism in the United States. Darlene Sarellano, an Edinburg resident and mother of one of the Girl Scouts, said it’s important for children to learn what happened on Sept. 11, 2001, so they can respect service members appropriately.